Click and drag in the table cells to select the cells to merge and click the Merge Table Cells button in the editor toolbar or in the right-click Context Menu in the editor. 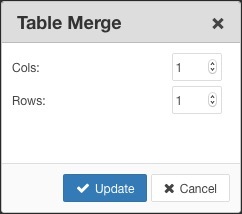 Click anywhere in a table cell and click the Merge Table Cells button to open the Merge Table Cells dialog. Enter the number of Cols (Columns) or Rows to merge and click the Update button. Click anywhere within a merged table row or column. A row or column is merged when it occupies more cells than the row or column adjacent to it. Click the Split Merged Table Cells button in the editor toolbar or in the right-click Context Menu in the editor.